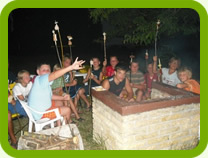 Our hostel can accommodate 90 people, it is easily accessible and has its own well-kept courtyard. We are located 300 metres from the beach, the train station is at walking distance (150 m). Rooms for 2, 3, 5, 6 people in the stone building, on 2 floors. On each floor you find finely refurbished water supply units, bathrooms. With help of our well-equipped kitchen we can provide 3 meals a day. 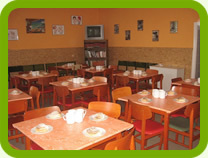 Of course the options "half board" and accommodaton without meals are also available. On the ground floor of the building there is a large function room, which also functions as dining room. This room is a perfect place for indoor programmes and in case of bad weather conditions many outdoor programmes can be performed here, like table football, competitions, board games, karaoke, dance). 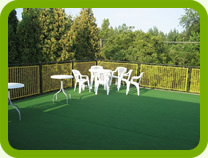 On the upper floor you find a smaller function room and a large terrace covered with artifical grass. 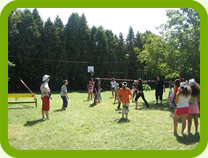 The large courtyard is perfect for outdoor programmes, sports (like football, basketball, volleyball our table tennis). In the garden you also find some shade from the heat of the sun. The benches, tables and seats provide a good background for relaxing or for having a chat with friends; the designated fire place is a perfect location for barbecues and grill parties. 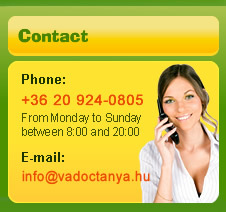 A hallgatói éveim legjobb táborát a Vadóctanyán töltöttem. A csapatépítő hétvége keretében, a felkészülés mellett jutott időnk a szórakozásra is. Kikapcsolódásként kirándultunk a kavics bányába, hajóztunk a Balatonon, lézerharcoltunk, és természetesen felfedeztük Gyenesdiás természeti szépségeit. A szállás és az ellátás tökéletes volt, melyet ezúton köszönünk a tábor két lelkének: Nóra néninek és Feri bácsinak.